No no I am not switching to disposables.. don't worry. 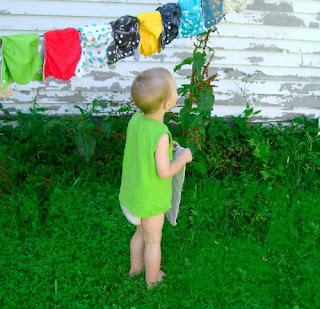 We are saying goodbye to diapers altogether and Bug is almost solely in underwear now. Saying goodbye to diapers is always a happy event but saying goodbye to cloth diapers can be a slightly sad one. As I packed away my sons prefolds, one of his diaper pails and all the pockets we weren't going to use as nighttime diapers for now, I had the following thoughts. 1. 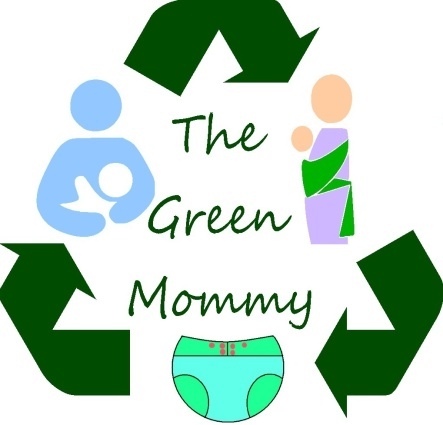 Being a cloth diapering mom you don't have that constant cost of diapers weighing down your monthly budget so there is no drive to stop that expense. 2. 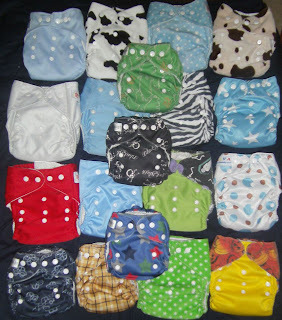 Cloth diapers are adorable and fun to shop for so having you kid move on can be a bit sad. 3. Like Breastfeeding it is such a part of a natural parenting culture that links you to other moms who cloth diapered or breastfed and suddenly you can find yourself feeling on the outside looking in.. The older crone Mom offering advice but not being able to really join in. 4. It means your baby/ toddler is really now a preschooler and is one step closer to a school age kid making him/her that much less your little baby. So for all these reasons and more I feel both happy and sad at the fact that Bug is shedding the diapers of todddlerhood and moving on to big kid undies. We have decided to keep all our prefolds, all our minkys, and all our alvababy and all our sunbaby. We also have kept our happy flute and popfish diapers. We are giving away though all our fitteds, all in ones, bamboos, velcro diapers, and any other pocket brands. I truly feel looking back over all the many many many brands we have tried that pockets and prefolds work best and out of the pockets the above mentioned brands are the only ones we have liked. So when we finally have baby #2 we will buy a few more alvababy to build our supply back up from the now 19 diapers to our normal 30 or so. So here is our final stock of the time tested brands we love.Goodbye diapers we will see you again someday soon I am sure.